Sunday afternoon I was privileged to join a large group of birders and naturalists at a preview of the forthcoming television program documenting the Great Wisconsin Birding Trail. This hour-long program was shown at Sundance Theater in Madison. On the Trail, an In-Wisconsin Special, premiers at 7 PM Sunday, March 1, with an encore presentation at 7 PM, March 12. The program provides an overview of the statewide birding trail and visits sites across the state. This program is a must-see! It will also be available for purchase as a high-definition DVD. 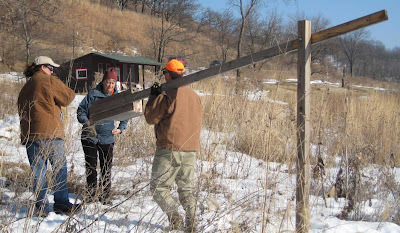 Yesterday (Feb. 21, 2009) the Invasive Plants Association of Wisconsin (IPAW) held an all-day conference in Madison. This was held in conjunction with the Annual Banquet of the Prairie Enthusiasts. Despite an overnight snow storm, the attendance was very good (over 300), and the meeting sessions were full to overflowing. The program for the meeting can be found at the IPAW web site. Further, the Power Point presentations will be archived on that web site and will be available to anyone. I was asked to give a talk on control of biennial weeds using nonherbicide methods. This is something I have a fair bit of experience in, because we have been dealing with sweet clover at Pleasant Valley Conservancy and Black Earth Rettenmund Prairie for the past ten years. Sweet clover is a difficult plant to eradicate because its seeds persist for many years in the soil. Also, its seeds are stimulated to germinate by fire, so that the fires that are so beneficial to our prairies bring about unintended consequences! If we keep sweet clover from going to seed, we should eventually be able to exhaust the seed bank. I have some details of sweet clover control on the Pleasant Valley Conservancy web site, at the following link. In addition to hearing good science at the Madison meeting, it was nice to see colleagues and those who in past years have either volunteered or worked as interns or employees for the Savanna Oak Foundation, Inc. Kathie and I feel it is so important to get young people involved in restoration ecology, and there were lots of young people at the conference. Great! Even though it hasn't snowed significantly in quite a while, it has been so cold that until yesterday virtually every snow flake that fell is still on the ground. The weather has finally (!) warmed up and the snow is starting to melt a bit. I spent some time this weekend wandering around, and was interested to see the snow melt patterns. These are important ecologically. The photo above shows the pattern around a nice white oak. This tree is on the upper south slope and so gets good sunlight on the south-facing side. Note how the snow has melted around the south side of the tree while the north side still has snow. This is a nice example of the way the savanna oaks influence the microclimate of the understory plants. I assume that what happens is that the dark tree trunk absorbs heat from the sun and then releases it again as radiant heat, some of which melts the snow. We have two kestrel boxes installed at opposite ends of the Conservancy, and one of these has been occupied the past two summers. Since the birds start looking for a nest location in February, we spent some time today getting the boxes ready. 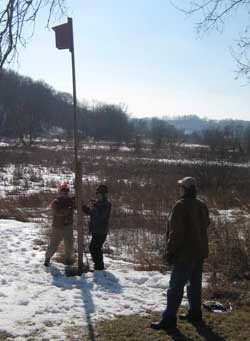 Kestrels like their homes high and remote from predators and other birds, and we have installed our boxes on special poles that provide the right conditions. The poles are arranged so that the houses can be brought down for cleaning and adding fresh wood shavings (which they like for their nests). This is a two- to three-person job and we were fortunate to have Marci and Jim to help out. The photos show the way the boxes are arranged and cleaned out. Hopefully, we'll be successful again this year! 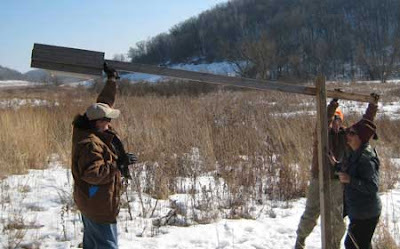 I found the design for the boxes on an Internet site, and the pole arrangement comes from Mark Martin at Goose Pond Sanctuary. Last summer during the dedication ceremony for Pleasant Valley Conservancy State Natural Area, the audience was sitting in front of the cabin you see in the above photo. The kestrel mother and father put on quite a show bringing food to the babies who were inside. Nowacki and Abrams important paper on the demise of fire in Eastern U.S. This is an important article, with lots of food for thought. The following is a brief summary, but read the original article, which is well illustrated with colored maps and photos. It can be downloaded as a PDF from several web sites. Nowacki, Gregory J. and Abrams, Marc D. 2008. The demise of fire and “mesophication” of forests in Eastern United States. BioScience 58: 123-138. There has been a dramatic reduction in fire in Eastern U.S. forests since the 1950s, and this has had major ecological consequences, leading to the elimination of fire-dependent species and the replacement by species favoring more mesic conditions. There is a feedback system whereby preclusion from fire encourages the growth of shade-tolerant mesophytic hardwoods such as red maple, sugar maple, beech, birch, cherry, tulip poplar, and blackgum instead of oak, pine, and hickory. 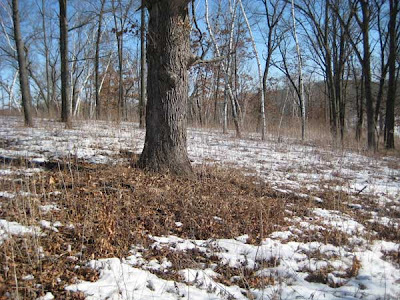 This results in a more closed canopy which discourages the growth of fire-tolerant species, including not only the oaks but also the high diversity of fire-tolerant herbaceous understory plants. By altering environmental conditions, maple and other shade-tolerant species deter fire through dense shading, promoting moist, cool, microclimates, and by producing fuels that are not conducive to burning. The authors call this process "mesophication". Mesophication is a stable state that is difficult to reverse, so that once it occurs, a return to the previous state is difficult. Therefore, once ecosystems become mesophytic, restoration becomes prohibitively expensive. The prospects of returning fire to the landscape is limited because of the unfavorable climate of the forest floor and the loss of fire-adapted species from the ecosystem. This article makes a good case that we are in a crisis situation which can only be overcome by huge increases in prescribed fire on the landscape. Despite the snow, it is not too early to start thinking about garlic mustard control. I recently learned of a very fine video on garlic mustard and am pleased to make the link available on my blog. This video focuses on the Upper Midwest and several Wisconsin people are featured.